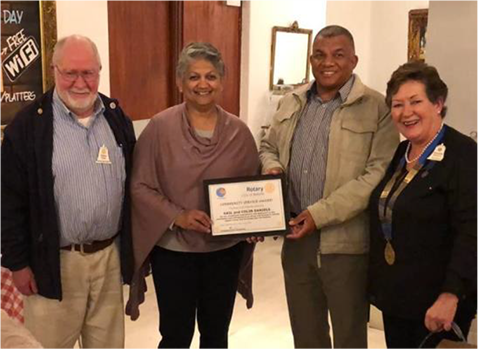 On Tuesday 31 July 2018, the Rotary Club of Bellville hosted an awards evening recognizing individuals in our community that have showcased excellent and selfless service. Congratulations to the worthy recipients of the club's community service awards, Gail and Colin Daniels, the co-founders of the Cystinosis Foundation of South Africa, an all-volunteer NPO Registered with the Department of Social Development who support/ Educate/raise awareness of this very rare disease and Ann Stephenson for 19 years of valuable and dedicated service to Tygerberg Hospice as a volunteer. 42 people attended the evening – our members, visitors from Century City and Newlands clubs and special guests from the Hospice and the Cystosis Foundation.